Cal Poly's Learn by Doing tradition means that the university's College of Agriculture, Food and Environmental Sciences produces a variety of student-grown and student-made food, flowers, plants and more that are for sale throughout the year to both the campus community and the general public. Some are produced as part of hands-on lessons in college classes. Others are "Enterprise Projects," in which the college provides money or resources, and students provide labor in design, production, packaging and marketing under the supervision of faculty. Net proceeds from Enterprise Projects compensate the students involved and can be reinvested in the project. Cal Poly wines, and the vineyards they came from, have had a long-standing tradition of producing quality wine. 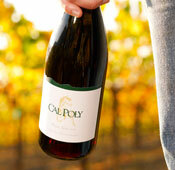 Starting with the 2006 vintage, Cal Poly established a new relationship with Orcutt Road Cellars. Its nearby location allows student winemakers to maintain close ties with the wines during the entire process – from vineyard to bottle. Since 1901 Cal Poly has been committed to educational excellence and a Learn by Doing philosophy. We are proud to present this premier wine, representing a collaborative effort by viticulture, enology, and wine business students in the Cal Poly Wine and Viticulture Department. The Cal Poly Organic Farm is an 11-acre production unit that is certified organic by California Certified Organic Farmers (CCOF). Student-grown organic vegetables and seasonal fruits are sold at our on-campus Farm Stand on Wednesdays and Fridays from 2 – 5:30 p.m., Saturdays from 10 a.m – 2 p.m., and at area farmers markets — Thursdays in downtown San Luis Obispo from 6 – 9 p.m. and Saturdays in Madonna Plaza from 8 – 10:30 a.m. 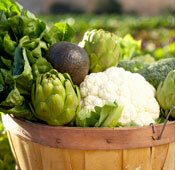 Seasonal U-Pick crops are available year-round. Organic produce is only available for purchase at these two off-campus markets. For more information, click here. 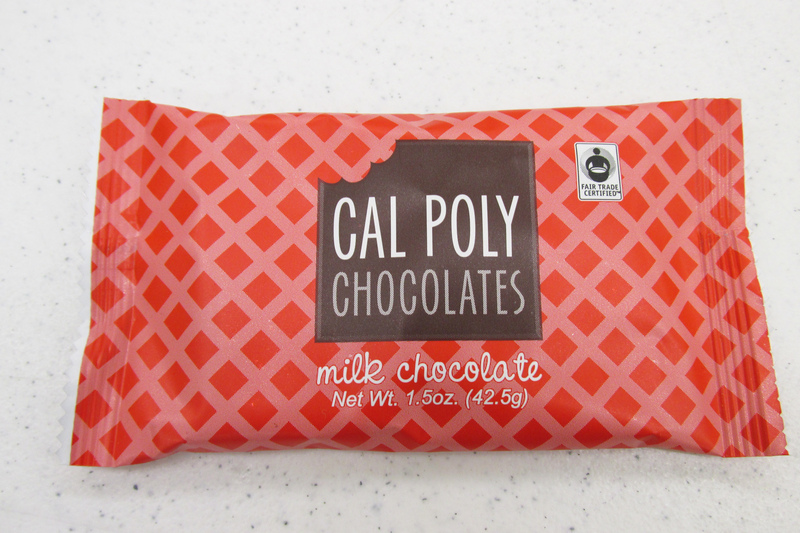 Cal Poly Chocolates, started in 2000 as a student enterprise project, is a part of Cal Poly's Food Science and Nutrition Department. Student employees, under the guidance of Operations Manager Molly Lear, learn how to develop, create, package and market various chocolate products using strictly organic and Fair Trade certified chocolate. Chocolates are sold in Central Coast markets, on campus at Campus Market, and by special order. The Food Science and Nutrition Department also develops. Cal Poly Jam and Cal Poly BBQ Sauce. 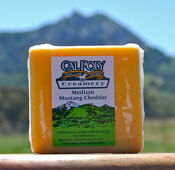 Cal Poly Cheese is a student Enterprise Project, operating in Cal Poly’s historic Creamery. Students are supervised by Dairy Science Professor Nana Farkye. Cal Poly Cheese Produces seven varieties of gourmet cheeses; they are available for ordering through the Cal Poly Cheese website and at Campus Market. Cal Poly's egg production program is comprised of 14,000 chickens and more than 3.3 million eggs a year. Cal Poly Eggs are sold in grocery stores around the Central Coast, and in the Campus Market. 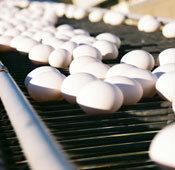 Cal Poly Eggs is an Enterprise Project, giving students hands-on experience in egg production. Cal Poly egg sales have enabled the College of Agriculture's poultry program to be largely self-funded; profits from egg sales buy supplies and equipment and support students who gain work experience in the commercial egg industry. Cal Poly Meats offers fresh beef, pork and chicken cuts and specialty meats and packages, including bacon, sausage, jerky, hot dogs, ribs, brisket, tri-tip, and fajitas. Students in beef, swine and poultry production and evaluation classes evaluate the meats and grade them according to U.S. Department of Agriculture standards, then cut, produce and package the meats as part of their classes. Their products are then sold to public. Cal Poly Meats is open to the public every Thursday and Friday from noon - 5 p.m. in the food processing building next to Campus Market on Via Carta, and also at Campus Market itself. Learn more here. The Swanton Pacific Ranch Natural Beef Project offers grass-fed and grain-fed natural beef for sale every spring, and grass-fed natural beef for sale in the fall. Cal Poly Swanton Natural Beef is minimally processed and never given growth-promoting hormones or antibiotics. Students participating in the project work throughout the year raising a herd of Black Angus-based cattle fed only grass and grains, pastured in rolling hills between the sea and the redwood forests on the university's Swanton Pacific Ranch in the mountains just north of Santa Cruz. The project gives students experience in ranch management and the cattle business as well as "hands-on" learning in ranching and agribusiness. 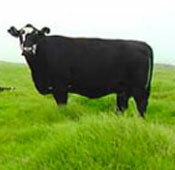 To order Cal Poly Grass-Fed Beef, contact calpolymeats@calpoly.edu. To learn more, click here. Poly Plant Shop is a commercial nursery and florist and is open year-round to the general public. The plant shop holds special sales events for various plant and flower Enterprise Projects throughout the year, including the holiday Poinsettia project and spring projects including Tomato Mania, Easter Lily and hydrangea sales. 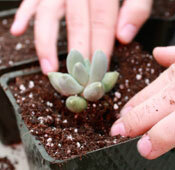 Year-round offerings include potted plants, bedding plants, houseplants, cut flowers, and flower arrangements. Metered parking is available at the shop, which is located on Via Carta across from the Equine Unit. Take the Highland Drive entrance to campus all the way to Via Carta; turn left at stop sign. Learn more here.